The calendar reminded me that the inevitable half day of school for conferences was approaching. I needed a plan. Movie? No. The day was too beautiful to be indoors. Biking? No. My daughter's bike was in the shop. The Great Egg Drop of 2016? Yes! I had been intending to do an Egg Drop with the kids for years, but just never got around to it. What is an Egg Drop, you may ask? Well, basically, you make a container for an egg, drop it out the window, and see if the egg survives. It was a huge success, with all kids involved asking when the next Egg Drop would be. Invite a few of your kids' creative friends You need to be sure these are kids whose parents wouldn't think you are crazy for allowing (and encouraging) them to drop raw eggs from your upstairs window. Gather supplies Most of the supplies were already somewhere in my house, with a few extras from the grocery store: cotton balls, toilet paper rolls and tubes, paper towel rolls and tubes, newspaper, plastic grocery bags (as containers and also for parachutes), foil, balloons, paper lunch bags, straws, boxes, cardboard, and the fake spider web we pulled down from the old Halloween decorations hanging outside. You also need masking tape, packing tape, and rubber bands. Buy a lot of eggs--I bought 30 eggs for 5 kids, which lasted about an hour and a half! Set the stage Open the upstairs window (be sure to remove the screen), and lay a tarp on the ground under it. Make a sign Greet your guests with a fun sign taped to the front door. Set the kids free! Give a simple explanation of the goal ("make something that will keep the egg from cracking when you drop it from the upstairs window") and let them be creative! Egg drop time! 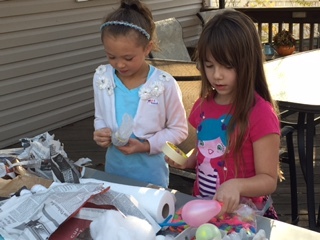 As each kid finishes their egg carrier, they can run upstairs and drop it out the window. My kids loved watching each other drop the eggs, and then predicting if the egg survived by the intensity of the splat sound as it hit the ground. They would then retrieve their egg and reveal a whole egg or...not! Require a lot of hand washing Remind them to not lick their fingers, and help them clean up their oozing containers with sanitizing wipes. Provide inspiration If creativity starts to fizzle, show them a brief video for inspiration. Here is one that we really enjoyed. I didn't show the video when we first got started because I wanted the kids to create their own inventions first. Clean up The kids helped a bit, but it might be best if the adults do most of the cleanup as raw egg and soaked cotton balls are involved, and adults might be a bit more careful about not spreading it around. Each time I've pulled out eggs to make for breakfast since The Great Egg Drop of 2016, I can see my kids eyeing them. I know their minds are turning with ideas for their next Egg Drop container. So, if you are passing my house on a nice day, be sure that you look up or you might just become oozed during the next Great Egg Drop!